Most of us are used to seeing instructions to “compare and contrast” things. Compare means to point out the similarities, and contrast means to point out the differences. Easy, right? But wait — when we compare two things, don’t we usually point out both how they are alike and unlike? Isn’t contrasting part of comparing? Is contrast redundant in compare and contrast? Let’s start with some etymology. Compare derives from the Latin com (with) and par (equal) — literally meaning equal with. A narrow definition (that some nit-pickers still insist on) would therefore limit comparison to identifying similarities — ways things are equal to each other. That’s silly, however, since, according to the OED, using compare to mean “identifying both similarities and differences” has been common since at least the mid-1500s. Depending on context, compare can mean to point out just the similarities or to point out both similarities and dissimilarities. Contrast is from the Latin contra (against) and stare (stand) — literally meaning to stand against. It means to point out differences, and that’s pretty much the only way it’s ever been used. The conclusion is that it’s fine to use compare when you mean looking at both similarities and differences. Most people get that. 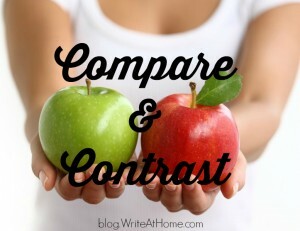 But since some think of compare more narrowly and according its literal and original definition, it makes sense to use “compare and contrast” for either emphasis or clarity. I’d love to hear your thoughts. Share them in the space below. Good to remember for the compare/contrast essays I coach!